George's Great British Kitchen - Nottingham. 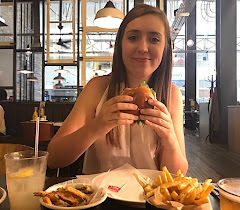 If you've been a reader of my blog from the start, you may remember that just over a year ago, I took my first visit to George's Kitchen in Nottingham (it was called George's Fish & Chip Kitchen back then). Recently, I was kindly invited back to give their new menu a try. Of course I jumped at the chance. I had such a lovely time before and had returned since too. Due to my day job, it meant that I visited at the weekend. This time a Saturday lunch. With a table reserved already, it felt good to skip the queue of hungry shoppers eagerly awaiting a free spot. We were taken upstairs and shown to our beach hut. I absolutely love this about George's. These tables are not only aesthetically pleasing, but they're great because they give you more privacy when you're eating. Our waiter introduced himself and left us to browse the menus. Like last time, the menus are newspapers. Another seaside themed element to the experience. Did you know that George's recently won an award for being the best city centre experience in Nottingham? To drink, I ordered a George's Lemonade. A homemade thirst quencher packed full of flavour without being too tart. From what I remember about my previous two visits, the choice was pretty similar, a few slight changes here and there. However, I did notice the addition of a tapas menu. I took Emily along with me, we were both starving! We decided to order the starter of Mushy Pea Hummus Bread Board to nibble on and 'keep us going'. What I noticed after ordering was how long this bread board was taking to come out to us. It was a good 20 minutes before we received and then to be greeted with what we were, I was a slightly disappointed. Our waiter did apologise for the delay but I was expecting a lot more from the starter. The main courses we served significantly quicker which we were very happy about. I chose to have something different to the obvious choice of Fish & Chips and I knew I wanted a dish that wasn't on the previous menu. That's why I chose the Halloumi, Baba Ganoush & Tahini Burger. I love Halloumi but if it's deep fried in bread crumbs, it's even better. I'll be honest, I had no clue what Baba Ganoush & Tahini are and I still don't but they tasted good on the burger! There was a real smoky flavour coming through which had just the right balance. Any more and it would've been far too overpowering. Emily had the Cod Dog. She knew she wanted Fish & Chips but also wanted something different. That's why she chose this. The cod finger is served in a brioche bun and comes with everything else you'd want from a chippy but served inside the bun itself. It went down a treat. We both chose the 'add on' of proper twice cooked chips. They were delicious although nothing really stood out in terms of taste or texture to say they were twice cooked. They're served on their own individual chip scoop which I think's a quirky touch. I already knew that I was having a dessert before I'd even stepped through the door. I've had the Famous Dessert Sharer on both of my previous visits and couldn't resist ordering one during this visit too. I'd told Emily all about it and she was up for it too. The sharer consists of Ice Cream (locally sourced from Matlock) topped with whipped Cream, Sprinkles, Raspberry Sauce and Flakes, Fresh Doughnuts with both a Raspberry and Chocolate Sauce then two big bundles of Candy Floss. This dessert is amazing. I'd totally recommend you have it should you visit. It's great to pick at, there's plenty of choice and it's something different to the classics. Soon after finishing our meals, we decided to make a move. I did enjoy my time at George's Great British Kitchen, the food was delicious, however I did note a few things. As mentioned, we visited on a Saturday lunchtime. The restaurant had every table full and I think this impacted on the service which we received. As time went on and the restaurant began to empty, the quality of the service did pick up but as a customer, you should get this throughout your time there. I'm pretty sure they know that this is going to be a peak time and should ensure staffing levels are increased to cover this. Our waiter didn't interact with us an awful lot which was a shame too. We were only ever asked how our food was after the starter, no other times. Also, we were not asked once if we wanted more drinks despite having empty glasses for quite a while. Other than those couple of points, I enjoyed myself. I think next time though, I'll stick to off-peak as previous. However, it was great to see how popular this place can be! Take a look at their website here or more info.